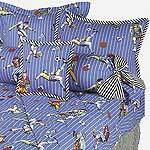 California Kids bedding line is known for its beautiful, 100% cotton fabrics and creative designs. California Kids bedding is designed to grow with your child. Also available in crib, twin, full and queen sizes.